If you occasionally feel disorientated about nutrition and have trouble identifying what you should be eating, then you are in the right place. 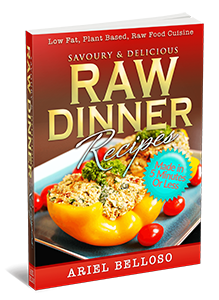 Thousands of people just like you visit Nutrition Raw every month for advice on how to eat raw foods the correct way to help your body thrive. Nutrition Raw covers much more than food. We share health tips and publish articles on natural health and diet with a unique perspective and ideas you would not want to miss. I became a DJ in my early teens. By the age of 15, I was already playing professionally to crowds of thousands of people in my native Argentina. In 1991, at the age of 23, I decided to move to Europe and continue my career in music. After living in Ibiza for a while, I relocated to London, where I have lived since. I worked hard over the years, perfecting my DJ skills and learning music production. My hard work paid off; by the late 1990s, I became one of the biggest DJs in the world. I sold over 2 million records and travelled the world intensively for over 2 decades; I performed in over 50 countries and in every continent – with the only exception being Antarctica. I am grateful for my career in music. Over the years, it has allowed me to express my artistic endeavours to the fullest. People of every race, colour, and gender have danced to my music; from the ghettos of South America to Beverly Hills and Miami; even in remote places, like Vietnam. I entertained a wide variety of people; from underground clubs to big music festivals, and I even played private parties for celebrities such as Jack Nicholson, Madonna, and Prince, among others. Sadly, my health didn’t flourish as well as my music career, and by the age of 37, it had started to deteriorate. I had peripheral neuropathy, arteriosclerosis, multiple allergies, widespread joint and back pain, severe gum disease, and many other symptoms that made my life miserable. I often felt dizzy too, and I suffered from constant ear infections that would last for months at a time; as a DJ, this is not helpful. I was also “addicted” to every substance you can think of, smoking being the worst drug but nevertheless not the only one. Like if that wasn’t enough, I was taking massive doses of painkillers on a regular basis just to get me out of bed, so I could feel “normal”. I was in a mess but the story doesn’t end there. During this time, I found out my mother had cancer. I was shattered by the news, as you can imagine. I’ll never forget the day my brother said to me: “Mum has two years left to live.” And this happened only two years after the death of my father from diabetes. So, what did I do? Was I content with medicine’s forecast and treatments? No! Something inside of me told me that I should study and try to find a solution to my health issues and those of my love ones. And so I did. For the next 8 years, I dedicated most of my time to research and studying natural health and nutrition. I was shocked to discover that the state and function of our health has almost nothing to do with what medicine or conventional wisdom has led us to believe. Naturally, I started implementing what I was learning and I began to heal myself. There is nothing more beautiful than seeing your body rejuvenate itself. I fell in love with this feeling. Thanks to my new diet, today I enjoy the most unimaginable level of good health and have more energy and vitality than ever. I no longer suffer any of my previous ailments, nor take any medicines. After a life of extremes and excesses, I feel blessed to have healed myself in such a natural, yet extraordinary, way. My mother, Ana, was diagnosed with leukaemia in 2001; she went through the standard cancer treatments, but her health was deteriorating. The chances of surviving leukaemia and going on to live for five years for a woman of 65 years of age are 33%, which means that by 2006, my mother’s cancer would have recurred. Well, luckily, after following my dietary and lifestyle advice, my mother not only managed to beat her cancer for good, but 17 years later she is STILL cancer free. Nothing I ever previously achieved in my music career has made me as proud and happy as the fact that I was able to help my mother overcome cancer. It’s an out of this world feeling. I cannot understate that my mother is an open minded person. She has followed my teachings for 7 years, and not only knows what to eat and what not to eat, but she has also mastered the concept of food combining, fasting, and other elements of health, such as adequate rest and relaxation, exposure to sunlight and exercise, etc. Since switching to her new diet, my mother has visited over 25 countries around the world, including China, Russia, the USA, much of Europe, Turkey, Egypt, Dubai, and Hong Kong. She has also travelled around Argentina, which is something I have not yet done. The rest of the Americas? Brazil, Uruguay, Colombia, Venezuela, Mexico? You name it, she’s been there! She has been enjoying herself immensely with excellent health and vitality that are much envied, admired, and commented on by her friends, and everyone that meets her. It is important to point out that she still eats mostly raw on her adventures, and without experiencing the slightest difficulty in doing so. We live in highly indoctrinated and ignorant society, where truth, logic, and common sense are often suppressed by vast political and economic interests. Mother Nature doesn’t provide the answers on a silver platter, but she doesn’t go out of her way to make it difficult. People have the capacity to see the truth, but they need to make the effort to find it. I believe my new goal in life is to help raise consciousness, guide people throughout the world in overcoming health and addictions issues, and hopefully, leave a much better planet for future generations. What is Your Philosophy on Health? If I could tell you my health philosophy in a few simple words, I would not have taken two years of my life to write Health For Life, nor would I have created many of my other products! If you take time to read about natural health – and my products in particular, you will start seeing things from a unique perspective. You will begin to “connect the dots” that will guide you towards a holistic understanding of health and disease, while discovering simple solutions and practical advice that will help you thrive. My teachings are unique in the way that I combine raw food education, natural health, and the understanding of mechanisms of addictions with an approach not done before. I believe a low fat, plant based diet is the healthiest diet out there. I also believe that eating whole raw foods are healthier than eating cooked foods – which are “processed foods” in essence. I also consider other aspects of human health, such as: getting sufficient sleep, rest and relaxation, physical activity, spiritual awareness, and others factors, to be just as important as diet. Sadly, our societies are not organised for healthy eating and living. We live in polluted environments where choosing the right diet and lifestyle is not always easy. For this reason, I am never fanatical about any one aspect of health alone. Some people might not be able to eat 100% raw all the time, but if they get plenty of exercise, get enough sleep, and practice other healthy habits; I believe it is a good thing. True health is within everyone’s grasp, but it is necessary to see the big picture. At BBC London Radio discussing natural health and the raw food diet. What Books and Programs Have You Written? I’d love you to hang out here with me, and spend some time on this site, exploring all the natural health options available to you. I have posts on specific topics, studies, articles, recipes, and products to support a healthy lifestyle.